Involve an Official Town Crier in your Wedding plans, and you ensure that the magic you have created for your Wedding Ceremony is continued for your family and friends to your reception, and throughout the course of the evening. Our assortment of wedding packages can include any of the following components to bring dignity and levity to your special day. Your Town Crier greets your guests at the Hall while the Bridal party is at the photo session. Simply seeing a Town Crier in uniform sets the tone for the evening, and gives the guests an unexpected topic of conversation. Your Town Crier will make your guests feel welcome, and will be able to answer any questions that they may have, such as details about a gift table or about the table seating arrangements. Once the Wedding Party is ready to receive guests, your Town Crier formally announces your guests by name, to the reception line. This avoids the embarrassment of forgetting a guest’s name, and allows sufficient time between guest introductions to keep the flow of guests comfortable. Some people enjoy hearing their names announced so much they get back in line to be announced again. Once all guests have been received and are socializing, your Town Crier requests them to take their seats at their tables, and with great pomp and ceremony, announces the Bridal Party, two by two, as they take their places at the Head Table. After the Head Table and guests are seated, as a Special Event, your Town Crier ceremoniously unrolls a beautifully customized scroll, reads an affirmation of your love for each other, and announces that the scroll will be brought to each table during the meal for your guests to sign. This is often a good time for your Town Crier can read any congratulatory telegrams and e-mails that have arrived, if you wish. Your Town Crier will then ask the guests to respect any of your particular wishes, such as the conditions upon which the bridal party will kiss, specific smoking instructions, instructions about taking pictures with the table cameras and leaving them behind, and any other housekeeping announcements that you wish. Special announcements about the evening’s schedule of events can also be made at this time. Your Town Crier will then formally request the clergy to ask the blessings if applicable. Your Town Crier will personally bring the beautifully customized parchment scroll to each of your guests while they are eating dinner. They will be invited to sign the scroll in the place provided, as an expression of their love and joy for the two of you on your Wedding Day. Some may write comments and best wishes, and others may only sign their name, but each will be a personal remembrance of the occasion for both of you to remember ever after. As the meal draws to a close, some of your guests may have wandered to the lobby or perhaps to left the tables for a drink. Your Town Crier will politely and formally invite them back to the ballroom, so the speeches may begin. He will gather them together, by officially presenting the signed scroll to the two of you, as a special memento to cherish forever, and again guide the guests to the next section of the evening. 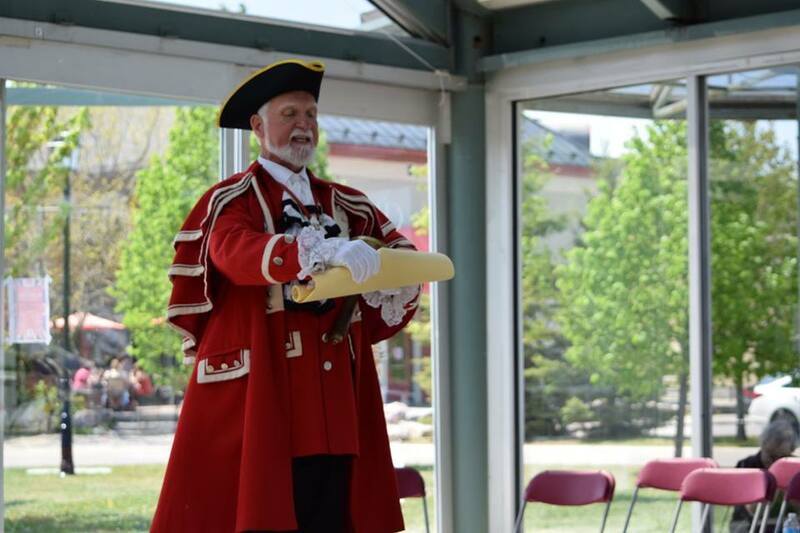 Usually the master of ceremonies is a member of your family who is able to speak in front of an audience, but if you wish, each of our Town Criers is professionally trained in the art of being a master of ceremonies. Your Town Crier will be able to smoothly and eloquently introduce each of your speakers in either a serious, or humorous way, which ever you choose. You may choose from Three Convenient Packages to fit your needs and your budget.